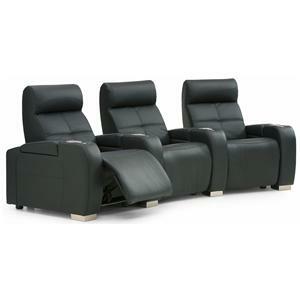 Bring movie magic into your home with this 3-person theater seating. 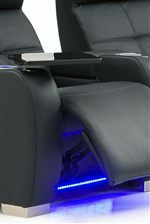 Pad-over-chaise seats and protruding headrests provide head-to-toe support. 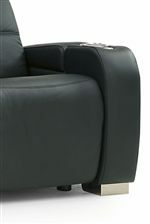 Bring sleek, contemporary style to your home theater with this simple, yet sophisticated group. Built-in cupholders and swivel tables make it easy to snack and work while lounging. LED lighting available. Available in manual and power recline. The Indianapolis Contemporary 3 PC Straight Reclining Sectional w/ LED Lighting at Rotmans in the Worcester, Boston, MA, Providence, RI, and New England area. Product availability may vary. Contact us for the most current availability on this product. 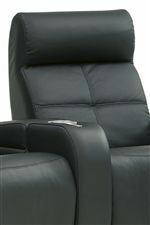 41955-3E Right Hand Facing Power Recliner 2 30" 39" 41"
41955-1E Contemporary Power Recliner 1 37" 39" 41"
The Indianapolis collection is a great option if you are looking for Contemporary furniture in the Worcester, Boston, MA, Providence, RI, and New England area. Browse other items in the Indianapolis collection from Rotmans in the Worcester, Boston, MA, Providence, RI, and New England area.